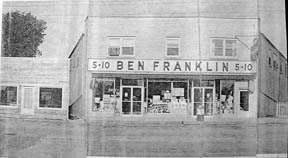 If you grew up or lived in Lisle Illinois between 1950 and 1980... You may find this web site interesting. Talk to almost anyone that grew up in Lisle during this time and you will get an ear full of stories about goofy places, "interesting" people and times that only Lisle folk can appreciate. Yes, we were only 35 miles from Chicago but it felt like Mayberry. Our local paper was only six pages thick but we did have WLS on our transistor radios. (Click here to hear old WLS jingle) We didn't have a "Youth Center" but we could always go buy penny candy and read our baseball cards in front of the Book Nook. 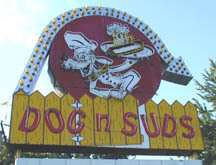 Some of you remember Mc Donald's as the local "hangout" while others remember "Dog n Suds" as the place to hang.. And maybe you still have a Dog n Suds root beer mug stored away somewhere. Do you remember Norman Oil on Ogden Avenue? "filler up and you get the choice of a glass or a towel!" Do you remember A&P? You could actually grind your own "Eight O'clock" coffee beans!!! Wow!!! And how about Ben Franklin? Anything known to mankind could be found in this place. My moms clothing patterns for sowing, toys, candy, and I even bought my first k-tel record there! You can still hear Ruth the cashier saying "One - twooo.. Thank you!" Or how about Economy Foods? Can you remember that old butcher counter? 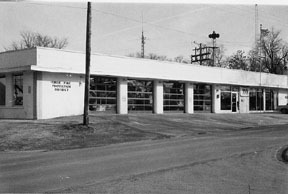 Lisle Fire Station 1970s. Click here to hear those horns! 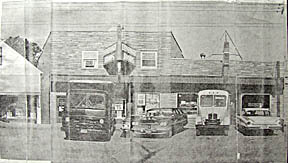 And what was with those huge "air-raid" horns that would go off every time there was a "fire-call" at the fire station? You could hear them throughout the town! And then you'd see those volunteer firemen, with their little blue police lights, flying through town beeping their horns on the way to the fire station. Pretty cool stuff when your a kid. Sometimes we would beat the firemen to the fire station on our bikes! Boy were we cool! Only known photo of Ol' Rosie! A true Lisle classic! How about the Trading Post on Ogden. You could buy an old tv, a used Popiel Pocket Fisherman, indian arrow heads and a real coffin!!! All in one place! And of course.. The MOTHER of all memories of Lisle.. The "witch burnings" on Halloween at Main Street School! Now this was classic stuff!